Reactions from Ryerson University to the United States’ travel ban continue to surface, as the Ryersonian learned that the campus’ social innovation community decided to offer an alternative to students not wishing to travel south of the border. It was first reported last month by the Ryersonian that the university’s School of Urban and Regional Planning announced the cancellation of its trips to the U.S. in response to President Donald Trump’s travel ban. The ban, which bars citizens of six majority-Muslim countries from entering the U.S., has been before the courts for a couple of months now. The decision was one that was arrived at fluidly through a natural conversation about the core values of Ryerson and Canada. According to Jean-Paul Boudreau, this is a conversation that needs to be had with key stakeholders, like the Muslim community. “It’s not just about us, there’s a broad community on campus [that is affected by the ban],” he said. 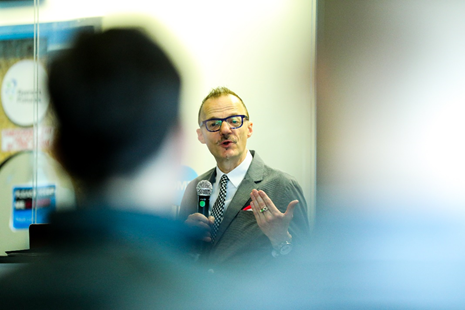 Boudreau is the executive lead and special adviser for social innovation. He said it was important to respond to the ban on behalf of the group’s students. Unlike the university’s urban planning school, however, social innovation did not completely cancel any trips to the U.S. Instead, the group took a more interactive approach, consulting with key community stakeholders about whether offering an alternative for those concerned about travel would be beneficial. The conversation arose in reference to the annual Ashoka U Exchange conference, which is focused on inspiring social change. This year, it was held in Miami from March 2-4. 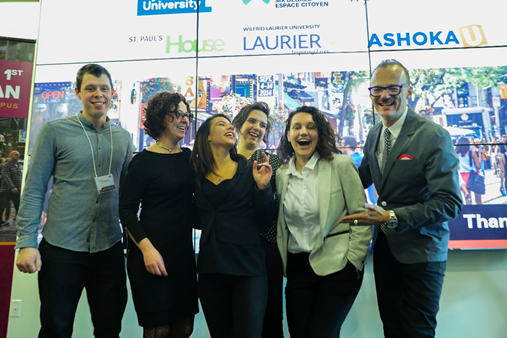 As an alternative, Ryerson worked in partnership with Ashoka Canada, Wilfrid Laurier University and St. Paul’s Greenhouse at the University of Waterloo to offer a satellite event in Toronto that would complement the global conference. It turned out that interest in attending the one-day Toronto event on March 3 was sufficient enough to actually host the event. Links were also provided to livestreams of the event to encourage as much participation as possible. The urban planning school’s decision last month drew attention to the impact the ban was having on Canadian universities, resulting in the cancellation of trips to the U.S. The consequences can be felt at local high schools as well — Canada’s largest school board, the Toronto District School Board, also announced U.S. trips would be cancelled. But Boudreau said he does not want to take away from the bigger picture. He hopes people will “focus on the many positives and resulting opportunities for continued dialogue about ways to connect culture, diversity, inclusion and student engagement” during difficult situations. “To be really frank, we didn’t make this about the travel ban,” he said, instead placing emphasis on the collaborative decision-making process that went into offering the alternative option. “This is not a boycott of an event at all,” said Boudreau, adding that the consultation process between Ashoka, Ryerson and the partnering universities began in mid-February. Email correspondence between representatives of Ashoka, Ryerson and the University of Waterloo cited the “growing unease” that Muslim community members may be feeling about travelling to Miami for the exchange. Boudreau said the response from those in the social innovation community to offering an alternative was unsurprisingly positive. That’s why staff and members of the partner schools and organizations decided to take a stand in solidarity, he said. “If I’m a Muslim student and I feel uncomfortable about the travel ban, I don’t want to be the face of that uncomfortableness,” he said. Have you heard of Alibaba.com?